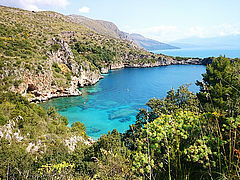 On Monte di Luna, the southern fringe of Marina di Camerota, you spend holidays in a remarkably exposed location. 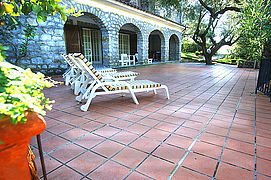 In an old olive grove, face to face with the impressive Saracen tower "Zincalo", lies Villa Zincalo. 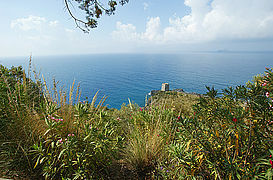 Below the rambling premises, the coast drops steeply down into the deep blue sea. 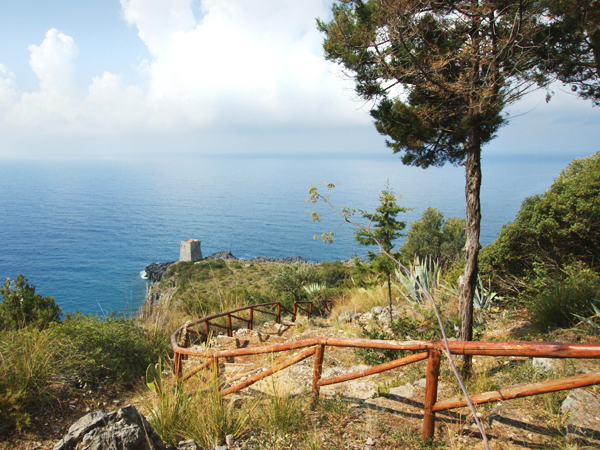 This uniquely beautiful coastal stretch is part of the maritime wildlife park of Infreschi, which must be explored in two ways: on foot to discover the spectacular seascapes and by boat to take in the up to 180 m high rock faces and the mysterious sea grottos in all their beauty. 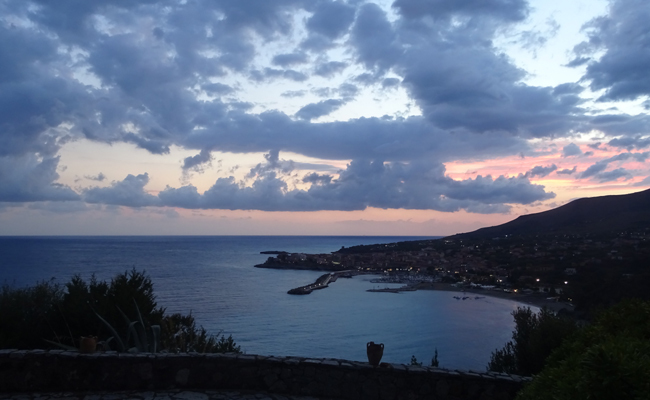 It is from the property’s communal terrace that you have got the best view of the sea, of Lentiscelle beach only 400 m off and of the fishing village of Marina di Camerota. 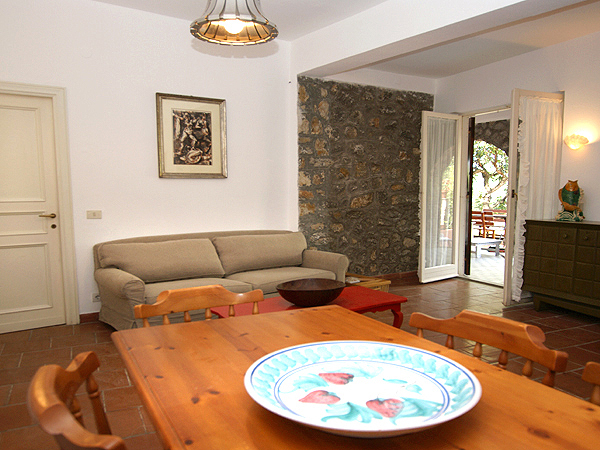 Not only the villa with its three apartments is located on the sloping premises, but also separate guest house Casetta Zincalo. 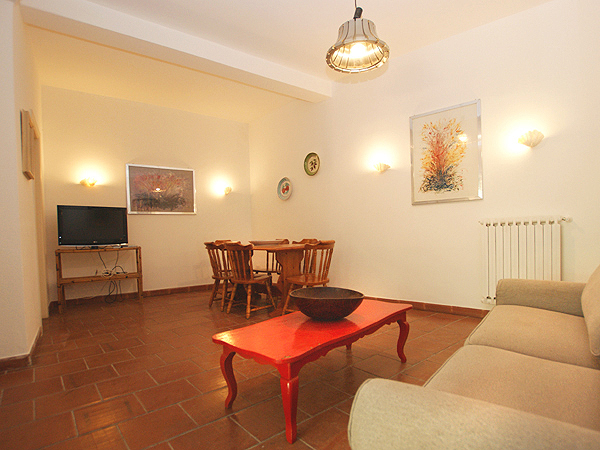 During vacation time, one of the villa’s apartments (above the holiday apartments) is, in general, used by the owners, who live in Rome. 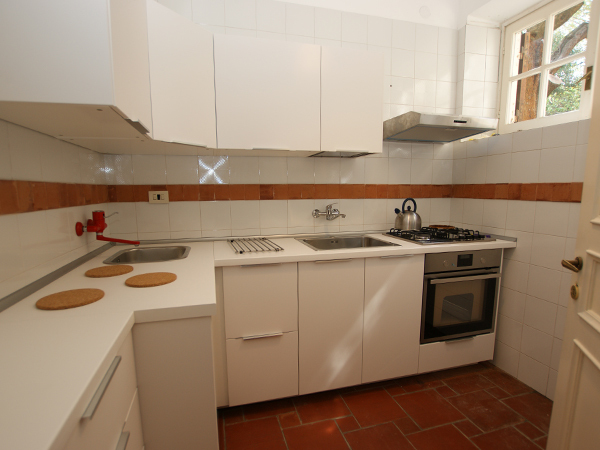 This apartment includes a large living-dining room, a separate kitchen, three bedrooms and two bathrooms. The living area with dining furniture, sofa and Sat-TV opens onto the roofed, private terrace of your holiday apartment. 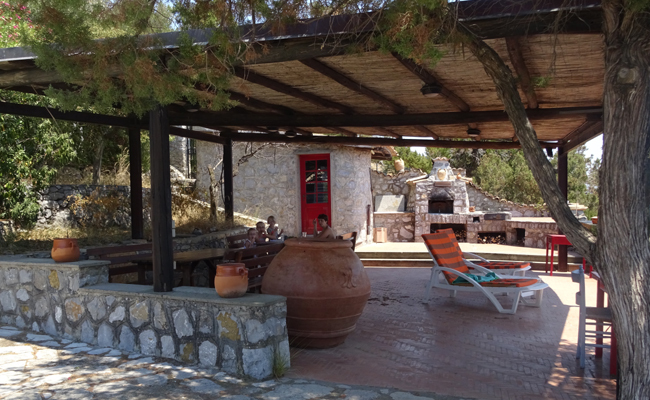 From the three bedrooms, two doubles and a twin, you have also got direct access of the terrace, where old olive oil amphorae and stone arches make for a special atmosphere. The kitchen of the holiday apartment is equipped with gas stove, oven, microwave and refrigerator with freezer compartment. Both bathrooms have got shower, WC and bidet. 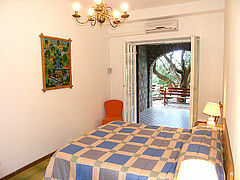 The apartment features heating and air conditioning (in one of the bedrooms). The smaller holiday apartment is similar in layout to apartment type A and includes a small living-dining room with sofa and Sat-TV, a built-in kitchen with oven, gas stove and refrigerator with freezer compartment, two bedrooms and two bathrooms. The two bedrooms are furnished with double beds. 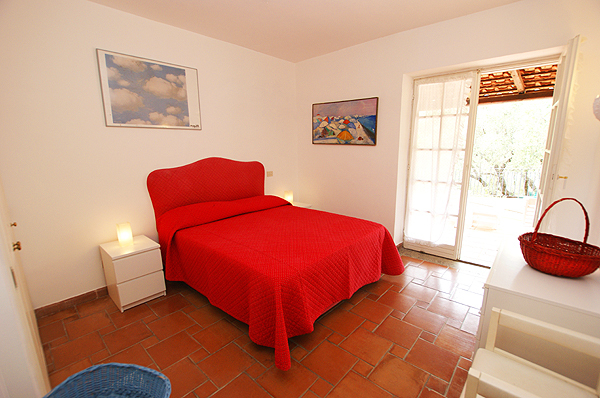 The larger bedroom and the living area open onto the apartment’s private and partly roofed terrace. The two bathrooms are equipped with shower, WC and bidet. The apartment features gas heating. As the daughter of the owners likes to stay at this apartment every now and then, it is only available on request. 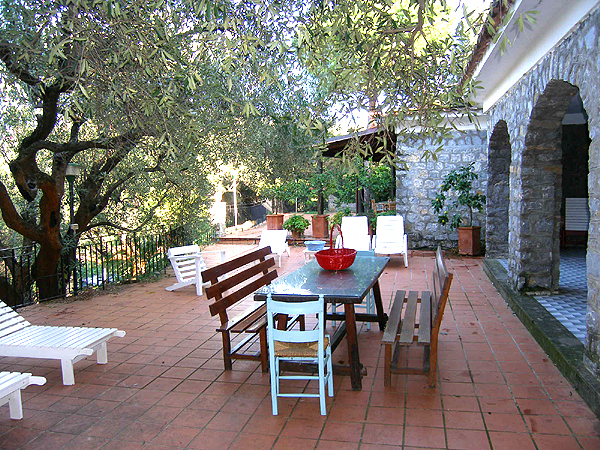 The old, bulky olive trees, which grow up close to the terraces, make for a special and Mediterranean atmosphere on the premises. 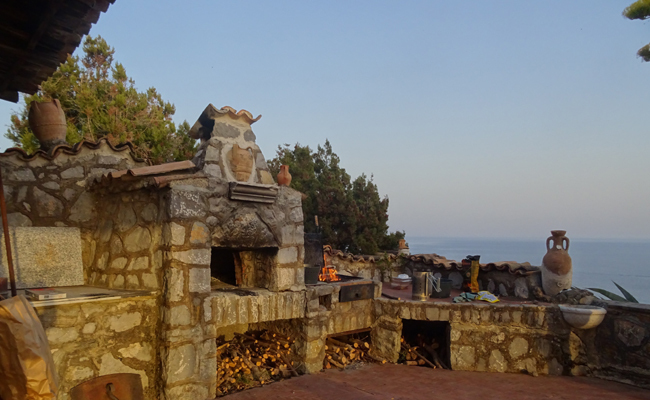 On the terrace for shared use by the guests you find a stone pizza oven at your disposal as well as a small outdoor kitchen, where you can easily prepare everything for your 'pizza evening'. 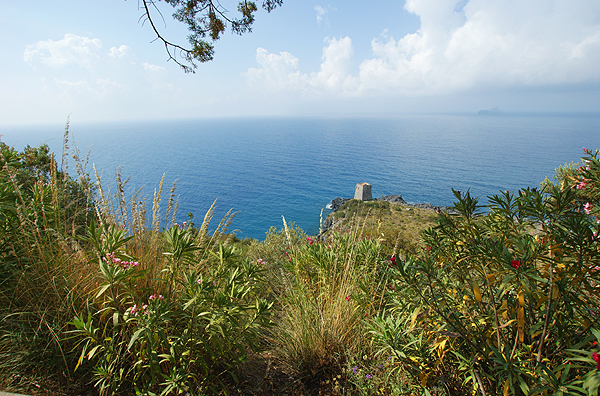 And all the while, you enjoy a fantastic view of the Tyrrhenian Sea and the Saracen tower at your feet. Sufficient parking is available on the fenced premises. Laundry service is available upon request and for a fee; for this service please contact caretaker Maria onsite. The access road to Villa Zincalo is a country lane of about 200 m, which branches off the paved residents-only road and ends at the entrance gate to the premises. From the premises, you can follow a trail down to Torre Zincalo, about 100 m, and the sea. 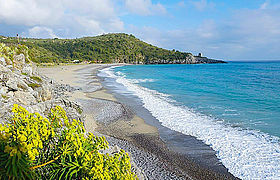 It is only 400 m on foot to the pebble/sandy beach of Lentiscelle, which lies between Monte di Luna and Marina di Camerota. 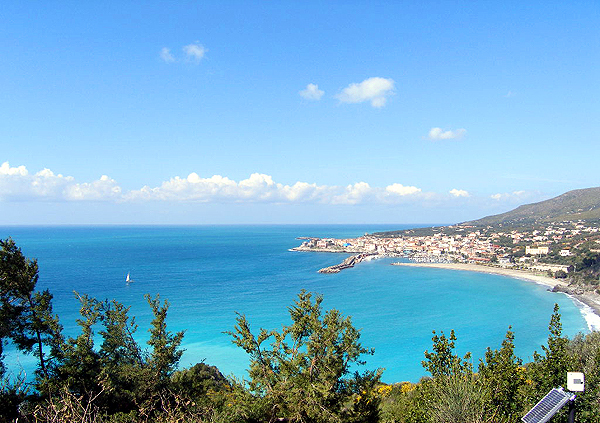 The coastal hiking trail takes you to the bays of Cala Bianca, Pozzallo and the natural harbor of Infreschi. 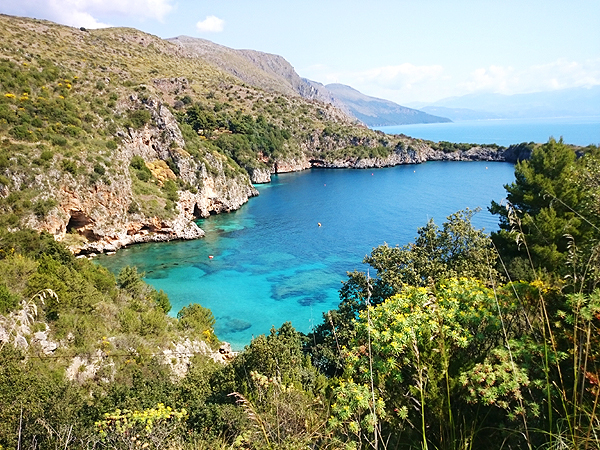 Between April and October, cooperatives Cilento Mare and Cilento Blu, both found at the harbor of Marina di Camerota, offer daily boat trips to these bays. 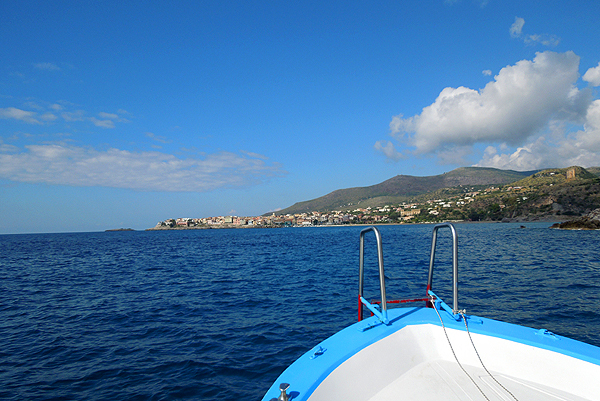 The center of Marina di Camerota is about 2.4 km off. 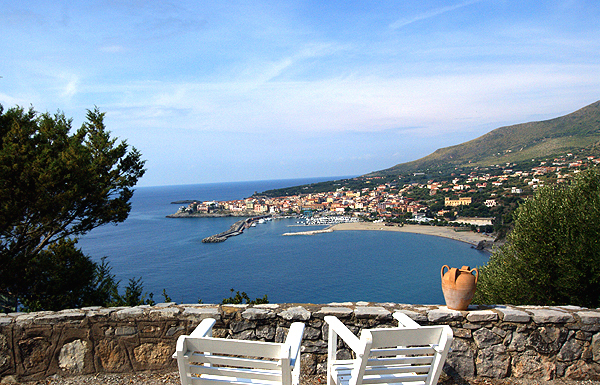 In the center around Piazza San Domenico as well as along the seaside promenade and at the harbor you find restaurants, bars, ice cream parlors, stores and Consentino’s bakery. 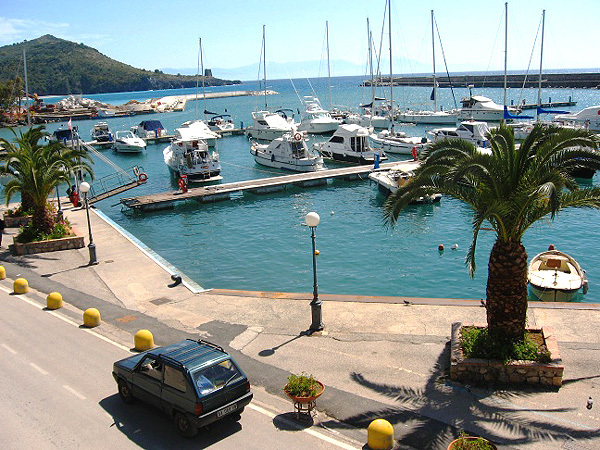 Two larger supermarkets are found at the entrance to Marina di Camerota. Once a week, a market takes place on the parking lot at the harbor. 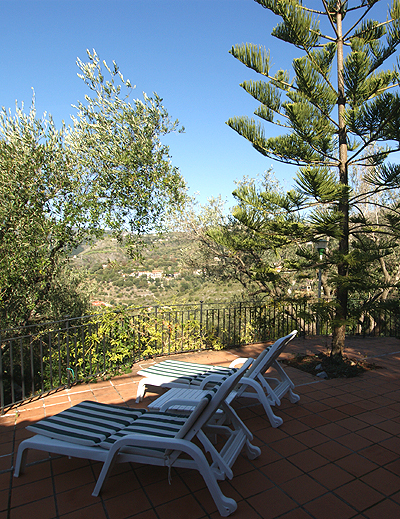 Panorama-Villa Zincalo is located in an olive grove above Marina di Camerota. Only 400 m from Monte di Luna and Villa Zincalo: the sandy beach of Lentiscelle (pic: Angelo Caiazzo). The spacious living area of apt. type A. Dining area of apt. type A. Spacious terrace with outdoor dining area (apt. type A). 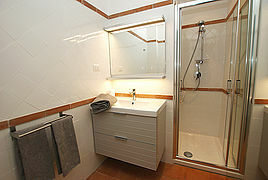 Double room with en-suite bathroom in the apartment type A. 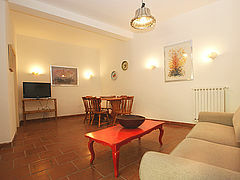 The second double of holiday apartment type A. 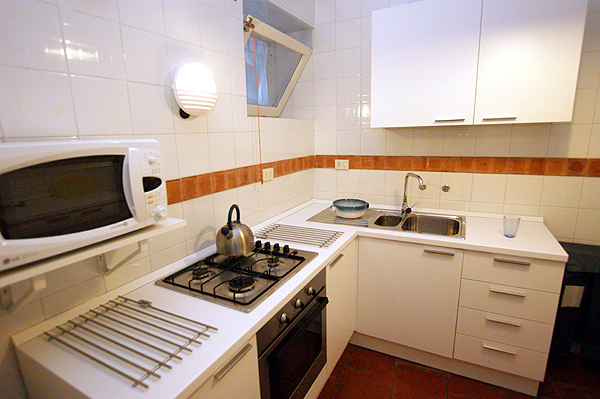 Glance into the kitchen of apartment A. One of the two bathrooms of apt. type A. Relaxing under old olive trees on the terrace of apt. type A. Marvelous view of the sea and Marina di Camerota from the communal terrace. Terraced path from the premises down to Torre Zincalo. The smaller apartment B for 4 persons. 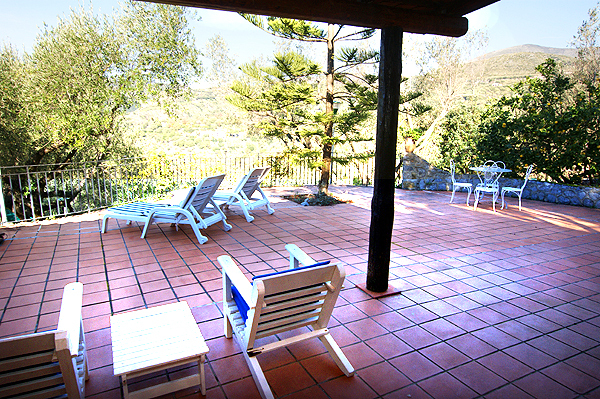 The spacious terrace of apartment B. 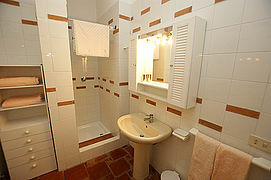 One of the double bedrooms with access of the terrace and en-suite-bathroom (apt. type B). 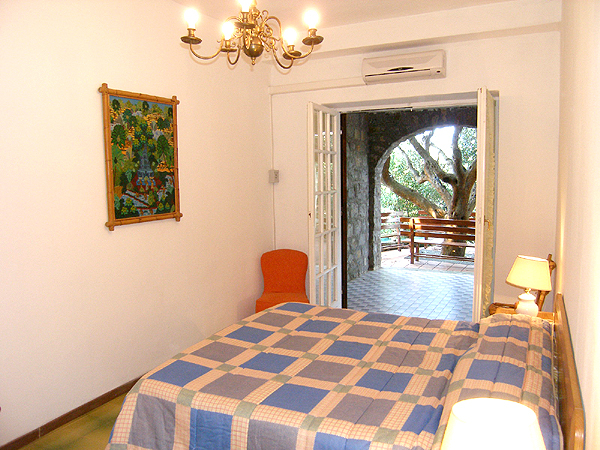 The second double bedroom of apt. type B is a bit smaller. 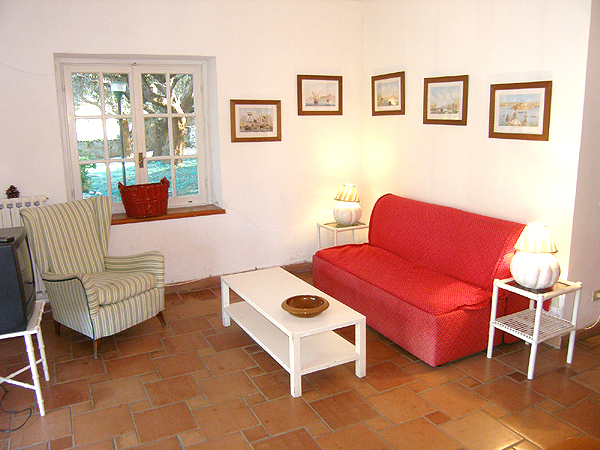 The living area of apartment type B. The kitchen of apartment B. One of the bathrooms of holiday apartment type B. 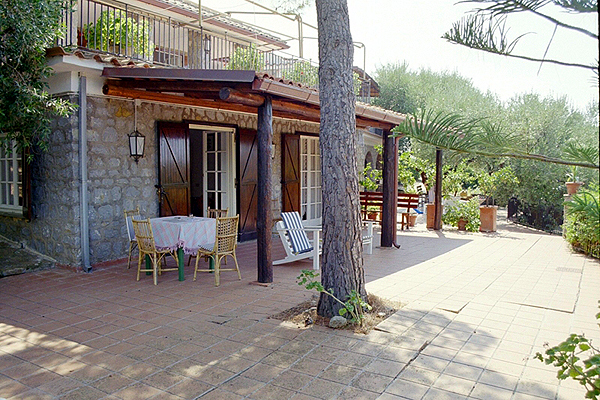 The partly roofed, large terrace of apt. type B. ...with a fantastic view of the sea and the old coastal watchtower. 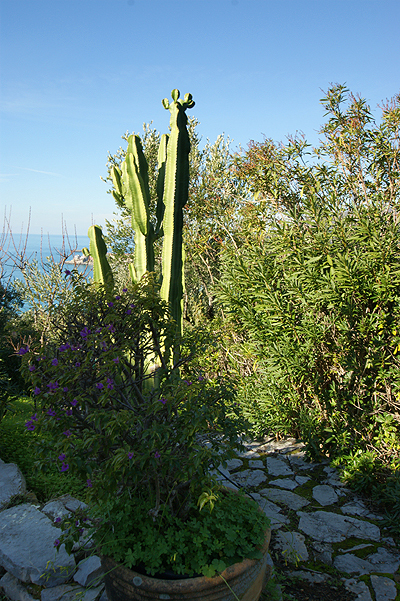 Mediterranean vegetation on the premises. 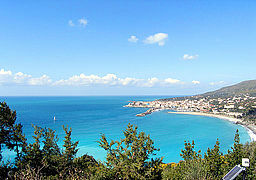 ...and on foot by following the coastal hiking trail straight to Baia Infreschi. The harbor of Marina di Camerota. Prices are valid per week and for the number of persons given in brackets and include bed-linen, towels and final cleaning. Costs for heating and air conditioning are charged onsite according to use. Flexible day of arrival and departure for stays of more than a week. Max. 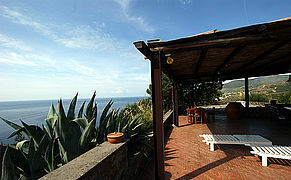 6 persons, 400 m to the sea, 3 bedrooms, Pets not allowed. Max. 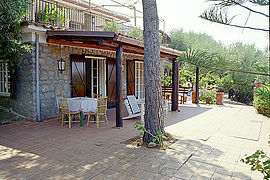 4 persons, 400 m to the sea, 2 bedrooms, Pets not allowed.